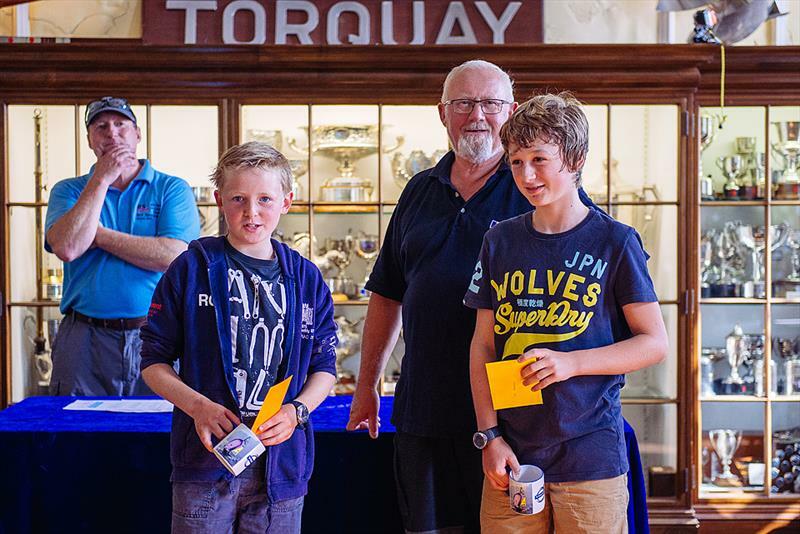 The UK RS Feva Volvo Grand Prix Circuit kicked off the new season with a light wind event at Royal Torbay YC. 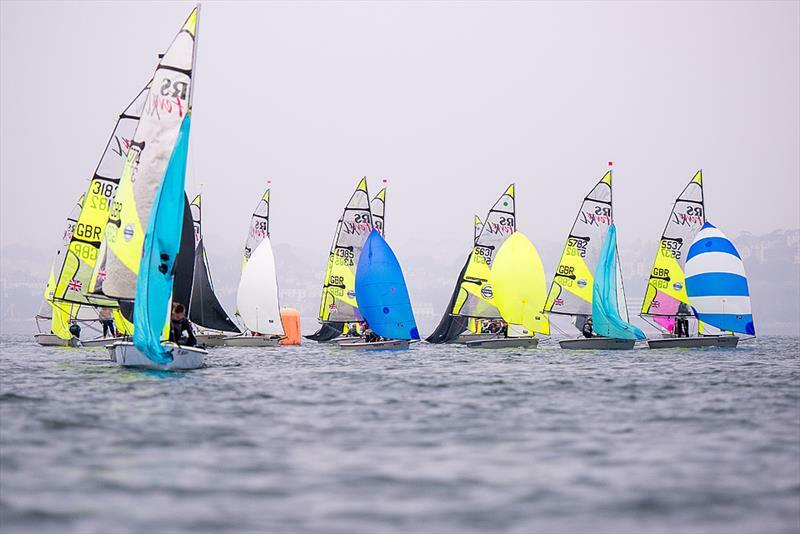 The GP is the first squad selector for RYA UK Junior Squad, Class National Squad & RYA S/SW Zone Squad; so lots to play for. Racing was postponed whilst the Race Officer waited for wind but eventually the fleet got away after an AP start; then after a general recall the fleet started under a black flag with 3 boats caught out. At the first windward mark Rory Odell and Josh Bonsey led the fleet followed by Daniel Lewis and Tristan Payne, with Jack Lewis and Lucas Marshall in 3rd. These positions held to the finish. The Race Officer was quick to get into sequence for race 2 and went straight into black as the wind increased to a steady 6.5 knots. Again Rory and Josh were in front, followed by Fin and Dan Armstrong,with Henry and Rupert Jameson in 3rd, as the wind increased to 8 knots. By the gate, Rory and Josh had a healthy lead, 2nd Fin and Dan, whilst Daniel and Tristan moved up to 3rd. By the 2nd windward mark Rory and Josh were just ahead of Jack and Lucas and they stayed 1st and 2nd to the finish, whilst Dan and Tristan held 3rd. Race 3 got away all clear in 6 knots of wind and the sun came out. Jack & Lucas were ahead at mark 1 with Rory and Josh in 2nd for a change; 3rd was William and James. By the 2nd windward mark Rory and Josh were back ahead, 2nd Jack and Lucas with William and James Cunliffe in 3rd, which is how they finished. So 3 bullets for Rory and Josh on day one. Day two was similarly light and sailors made their way out in 8 knots of shifty breeze. By the time race 4 started the wind had dropped to 4.5 knots. Jack and Lucas led the fleet at mark 1, 2nd Daniel and Tristan, 3rd Iain and Jake as the wind increased to 5.5 knots. By the finish it was Jack and Lucas still ahead, 2nd Iain and Jake, 3rd Daniel and Tristan. The Race Officer held off from resetting the course as the wind dropped further. Eventually as the sun came out, the wind came back in, and race 5 got away after an hour of waiting. 5 knots across the course and the fleet got away all clear. Leading the fleet were Daniel and Tristan, 2nd Iain and Jake whilst India Edwards and Fin Maciver were in 3rd. Iain and Jake took the gun, 2nd Daniel and Tristan, 3rd Rory and Josh which was enough to secure victory.